We Are Social and Hootsuite released the Digital 2018 report analyzing digital trends around the world. Egypt with 98 million people has an internet penetration of about 50% (49.23 million people). Mobile penetration rates came really high at 102% which is about 100 million users. While mobile social users stood at 36% which is 35 million people. 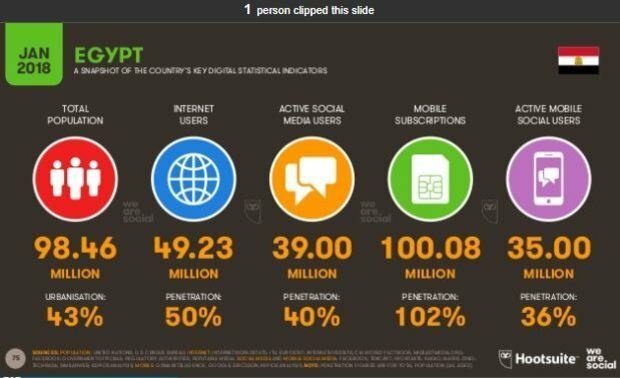 In North Africa 49%have internet and 38% are active on social media while mobile connectivity is at 106%. The figures were presented as part of the Digital 2018 report which is released annually by We Are Social and Hootsuite. The report highlighted that by January 2018 there were 4 billion internet users globally which is more than half the world; 250,000 of these joined the internet world in the last year. This is due to the increasing affordability of smartphones and data plans offered by operators. Now two thirds of the world has mobile, with 200 million people buying their first mobile in 2017. The average person spends about 6 hours per day online. With the top social media platforms in the world being Facebook, Youtube and Whatsapp respectively.